are the plans for the restaurant or mini retail still on for the site of the park? I was responding to the "less brown" comment. Bayous are slow moving swamp rivers. They have brown water. This aint the hill country. I will say if the mini bayou comes out well then that would be pretty awesome to see. Hopefully it is a vision of what we all have our future big bayous look like. Dont worry. In about 100 years the warming waters of the Gulf of Mexico will be lapping at these residents' feet. Anyway, this is going to take away from the uniqueness of discovery green. Just my opinion. how so? this one appears to be about 10% the size of Disco Green. I do believe he meant the larger park on this rendering. Site plan for this is something only a mother could love. Why is the retail separated from the park? To bring the building nearer the rail station so the residents don't have to walk too far and risk getting slightly more exercise in their commute than the typical suburbanite? Only great idea for this was Crossley's full length park. Short of that it would be better if it were chopped up into normal size blocks and one of those blocks was a park. A park glued to a run-of-the-mill mid rise with no ground floor retail and the other sides of the park already developed is a big wasted opportunity. I for one am hoping somehow Camden goes under before this thing happens and the land gets sold to Post or someone else with vision and a pair of ballistic architects who will design this right. Difference is on Gray they have to maintain the whole environment themselves, whereas here they'd be adding to an existing scene of sidewalk retail and pedestrian life. I know the post was actually doing so well they raised everyones rent exponentially and just about everyone except for Farrago stayed put. Farrago didnt leave because of bad business, they were doing quite well financially, they just refused to pay the new ridiculous rent. Did not realize how close to downtown this block was. It will be much used by the growing residential population downtown and midtown areas. Sweet jesus. Better late than never! Will the park and residential be constructed at the same time? "After the selection of tenant(s), the schedule should include a period of collaboration between Midtown and the tenant(s) to design the core and shell of the store(s) from March 3, 2014 to April 25, 2014. Midtown will initiate construction of the project on or before June 30, 2014 and deliver the core and shell to the tenant no later than April 15, 2016. The tenant(s) will complete tenant improvements and open the restaurants on or before August 15, 2016." That is great. It will be ready for Super Bowl. I'll keep my fingers crossed, but . . . . Very exciting but redundant. Still better than what its replacing. I have heard a start date of 04/14 for this. right? Discovery Green has been an enormous success.. how many people live in downtown? (around 4,000.. including the prison population who i doubt frequents the park) and how many people visit DiscoGreen each year? (over a million, around the same amount as visit Klyde Warren in Dallas, which serves as the boundary between uptown [over 13,000 people] and downtown [over 8,000 people], the two largest urban districts in the city) i say replicate on, Houston! every park cant be a one off facility like Bethel Church Park.. if the Midtown Superblock park is DiscoGreen II is Levy Park @ Kirby Grove going to be DiscoGreen III ? 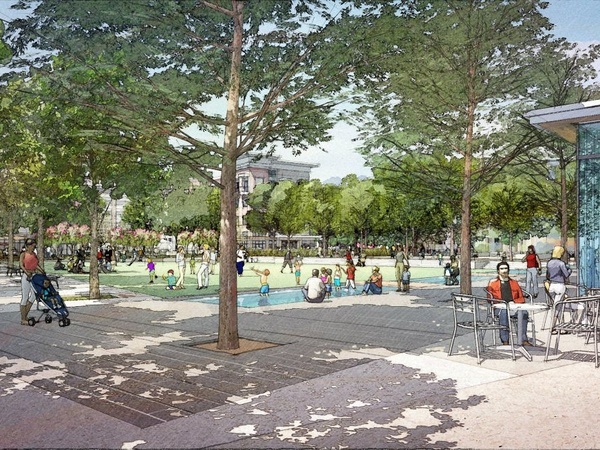 will the Park at San Felipe be DiscoGreen IV ? when will the madness end.. a park is a park. there is a set standard of amenities that most successful parks follow, and these parks are following that. if the layout was similar to DiscoGreen i could see your point.. but was every park founded after Central Park considered a copy of Central Park if it had lakes, grassy areas, and/or paths through the trees? It looks the park is half the lot when including both sides, is that so and was that always meant to be? There's a big hole there this morning. Must be for the parking garage. That is the case. I'm at this spot everyday catching the train. No activity at Camden McGowen, except for cars still parking there. Alexan Midtown is now a giant hole in the ground. I drove by earlier and they have a Camden sign up now, although I'm not sure that would even count as progress. I'm not sure what the parking agreement was with the valet service, but perhaps they have to let it expire before breaking ground? Are you talking about the Camden sign on Travis? It has been there for many months. Yes, I was referring to sign on Travis. I don't often travel from that direction, so it was the first time I had noticed it. No worries! This project is definitely going to happen and it's a good thing to hear that it will happen this year.. finally! The company's Camden McGowen Station project, a proposed eight-story building in Midtown, is expected to break ground by the end of the year. Camden's president, D. Keith Oden, said rents at its new Midtown development along Main at McGowen are projected to be in the high-end range of around $2.30 per square foot. The six acres it is building on also will include retail and a three-acre city park. nice illustration. perfect for midtown! eight story edifice, quite ambitious, as per midtown. exciting times ahead. Better than I thought it would be, but far from great. If this truly is going to be "one of the most desirable places in Houston," the programming and architecture should be faaaaaar better. Arguably, the most prominent site in Midtown and there's not a sq inch of retail. Midtown Redevelopment Authority had to program retail all around them, Camden was so opposed to it. It's a shame that Ric Campo, also chairman of Houston First, refuses to do retail in any of their projects in their hometown. Shameful. 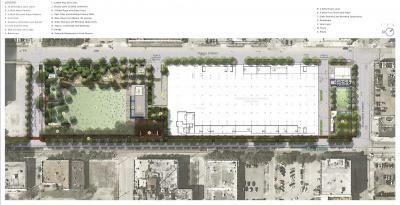 "The six acres it is building on also will include retail and a three-acre city park." Am I dumb, or do I only count 8 here? http://www.houstonchronicle.com/business/real-estate/article/Camden-bullish-on-Houston-s-inner-city-5461618.php"The six acres it is building on also will include retail and a three-acre city park." Camden is not doing any retail. After almost a decade of negotiations, they still would not include it in their project, so the Redevelopment Authority had to save the day and program retail next to and around Camden. A company based in Houston that does mixed use in almost every other market, except Houston, Camden is about as obstinate a low-quality production builder as there is...in Houston. But, bravo to the Midtown Management District and Redevelopment Authority for rescuing this project and creating the retail that Camden wouldn't. It'll be a fantastic park, albeit divided, that should become the center of Midtown. It kind of looks like a spruced up suburban Hotel (The apartment portion). Changing the game for sure. I don't see anything new that will change the game. Its just another in a long line of midrise complexes. When we start getting clusters of 30 or 40 floor residential towers then that will be a game changer. The park looks nice but the complex is doing what every other is doing in midtown, increasing the density in the area and covering up an empty lot. Weren't they going to break ground this spring? And before that, last year? And before that, eight years or so ago? LargeTX is right, this thing is a disappointment on multiple levels... maybe 7 or 8 levels. Maybe there is a below ground garage floor.